In his Apostolic Letter on the Occasion of the Year of Consecrated Life Pope Francis, writes on the importance of inter-congregational collaboration. He says, “I hope for a growth in communion between members of different Institutes. Might this Year be an occasion for us to step out more courageously from the confines of our respective Institutes and work together, at the local and global levels, on projects involving formation, Evangelization and social action? This would make for a more effective prophetic witness. Communion and the encounter between different charisms and vocations can open a path of hope. No one contributes to the future in isolation, by his or her efforts alone, but by seeing himself or herself as part of a true communion which is constantly open to encounter, dialogue, attentive listening, and mutual assistance”. “Ours is an age of networking, of synergizing, of working together. The globalization process is forcing us to accept this as a fact and as a necessity”. Fr. Josep Abella, former Superior General of the Claretian Missionaries (and recently appointed as Auxiliary Bishop of the Diocese of Osaka), calls our attention to the need for greater sense and practice of inter-congregationality. He points out that, on the one hand, there is “a considerable decline in the number of staff serving our Institutions in certain parts of the world”; on the other hand, the process of globalization “are posing challenges to which it is difficult for Institutes to respond in a significant way”. Thus he appeals to Religious Congregations to “take the path of inter-congregational collaboration with greater determination” in which “we can plan evangelization initiatives that can respond significantly to the challenges of the contemporary world.” (quote taken from ”Wake Up the World!” by Samuel H. Canilang, CMF). April of this year, with the leaving of Sr. Abby Avelino, M.M., this is precisely the new journey taken by the John de Britto English Center. People who did not know she already left are surprised to know that four persons took her place as Coordinator – Adelfa Armentia (Poveda Institute), Sr. Leny Fery，FdCC (Canossian Daughters of Charity Servant of the Poor), Srs. Flor Florece and Rose Remigio, F.I. (Daughters of Jesus). And with the untimely demise of Fr. Kerkmann, Fr. Robert Chiesa, SJ (Society of Jesus) is the new Director. From now on, they will work as a TEAM at the service especially of the English speaking Community of St. Ignatius. Major tasks have been divided. To cite a few examples, Adelfa, Sr. Flor and Rose are the persons to approach for Catechisms classes (Sacraments), Sr. Leny for Youth Ministry. 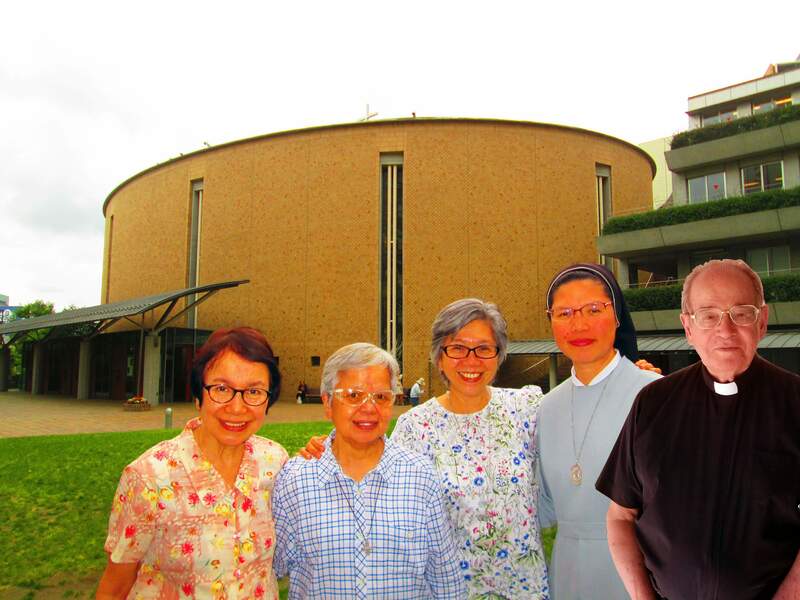 They each have their respective days in Coordinating the 12 noon English Mass, liturgical and church events, formation activities and group meetings. For the English Bulletin, they work as a Team with technical assistance from lay volunteers. Inter-congregational collaboration is not always easy. There are concrete implications and challenges. As Pope Francis said, it implies being “open to encounter, dialogue, attentive listening, and mutual assistance.” And in the words of Bishop Abella, it will “demand new organizational models of community, new structures, common discernment processes”. And if the team may add, after three months of experience, the transition needs time, a lot of flexibility, patience, complementarity of gifts and above all, openness to the Holy Spirit, not just on their part, but likewise, by all those involved in the bigger community which is the Parish! It is a journey, at the service of God’s kingdom here in Japan!